How are you all doing? Am just wishing for summers to pass and waiting for a splash of rain 😣. In summers its really difficult to maintain a tan-free skin. Since I have sensitive skin, I get sun burns lot of times. So I have come across a nice scrub made with natural ingredients for daily use. Its from a new brand called Mitti Se. I won this face scrub in a contest long time back. Now while going through their website, I saw that they don’t have it as a face scrub anymore but as a face wash with new, improved packaging. But its the same product. Am also testing some more new Mitti Se products currently, so subscribe to my blog and stay tuned for the reviews 😊. 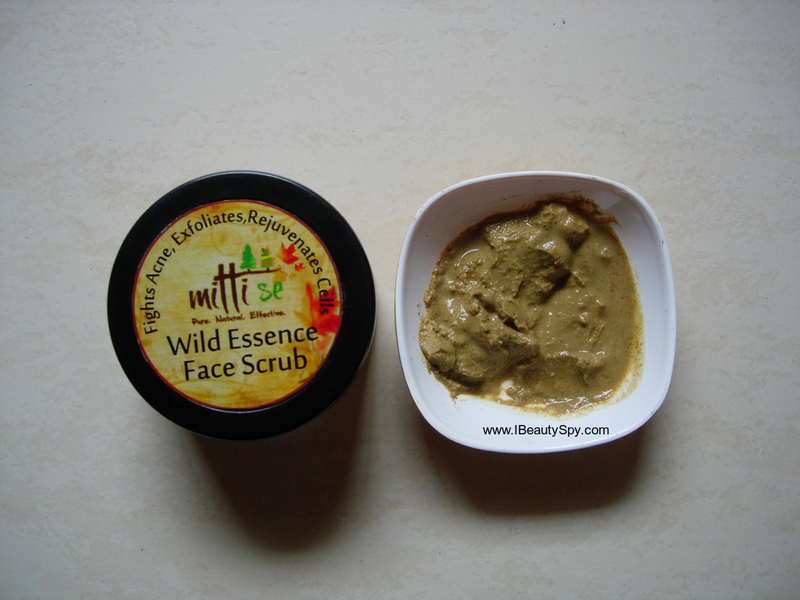 Let’s move on to the review of Mitti Se Wild Essence Face Scrub. Mitti Se means ‘From the Earth’. Clears pores, removes dead skin, suntan & fine wrinkles, fights acne, imparts a uniform complexion and a healthy glow. Almond, lemon peel, black & red gram, rose, fuller’s earth, neem, turmeric, alum, essential oil of geranium. 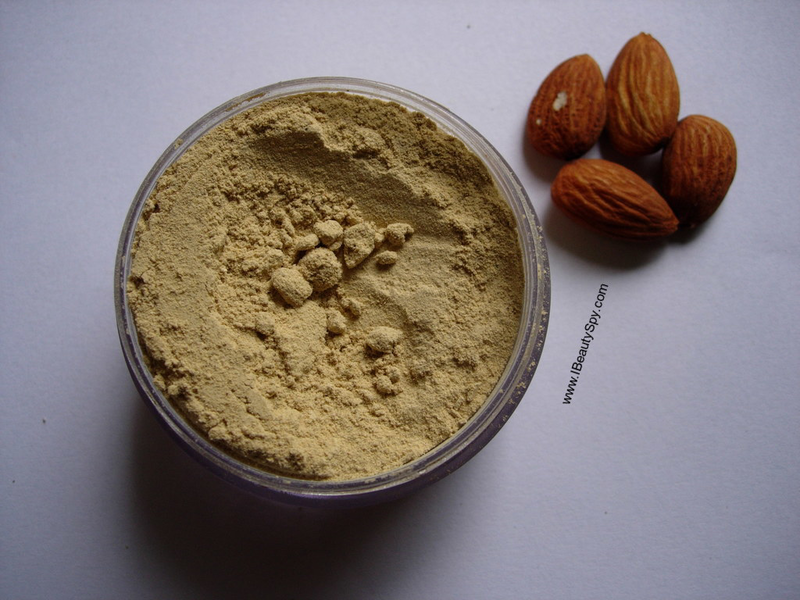 Mitti Se Wild Essence Face Scrub comes in powder form. It is light beige brown in color and has a soothing herbal fragrance. The scent is from the natural ingredients and one whiff will instantly calm your senses and look forward to treating your skin with this goodness. 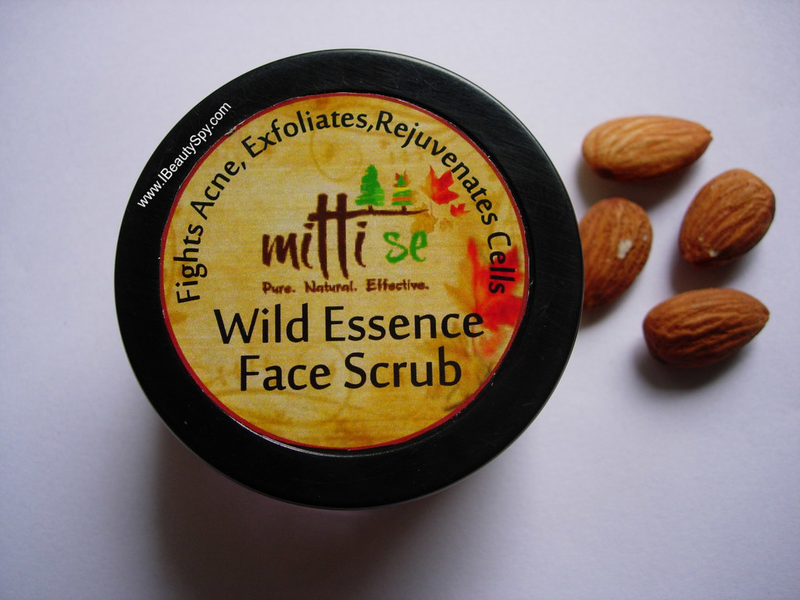 Mitti Se Wild Essence Face Scrub can be used as a daily cleanser or scrub or mask. So its a 3-in-1 product. I have been mixing it with water and using it as a cleanser everyday. Thrice a week I mix with curd and apply as a face mask. While washing I scrub gently to remove the dead cells. The particles are gentle and not abrasive on the skin. They provide gentle exfoliation. I can see a remarkable improvement in my skin with regular use of Mitti Se Wild Essence Face Wash. It removes all dirt and impurities and clears clogged pores. It gives an instant refreshed feeling. It doesn’t strip the skin of natural oils or cause dryness. With continuous use, I have observed my skin has become soft and most of my sun tan is removed. It gives best results for me when mixed with curd. You can see a visible reduction in sun tan. My skin looks more even-toned and complexion improved. It doesn’t prevent pimples but helps to subdue existing ones, but it takes few days. Regarding it claims of removing wrinkles, I haven’t noticed any difference. And I don’t think a face wash/scrub can remove wrinkles after all. 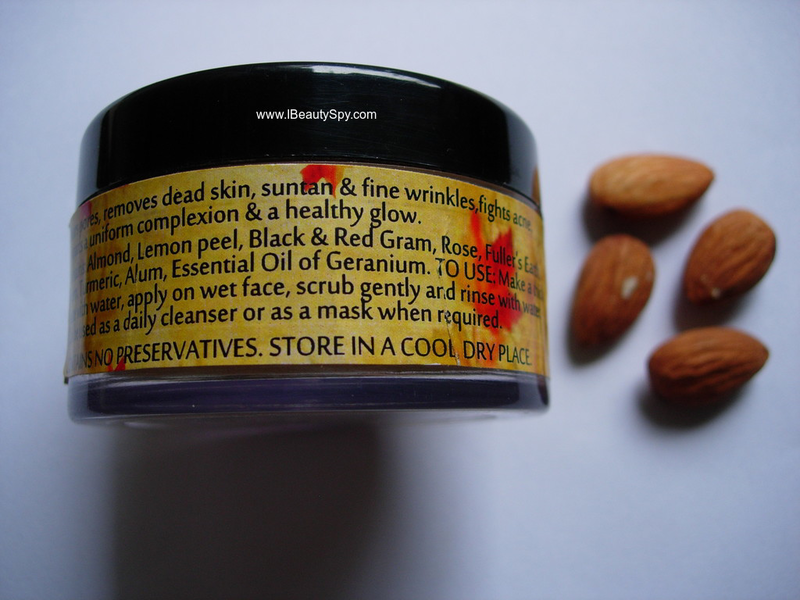 But it might help to prevent wrinkles as it doesn’t dry out skin and nourishes it with goodness of almond, red & black gram and rose. Overall, Mitti Se Wild Essence Face Wash has helped me get healthy, glowing skin. One tub can last you for a month. So its pocket-friendly as well. You get a jar full of skin nourishing ingredients for the affordable price. * Comes in powder form, so is free from parabens, SLS and other chemicals. * Can be used as cleanser, scrub or mask – 3-in-1 product. * Cleans and purifies skin effectively without causing dryness. * Skin feels cool and refreshed after using. * Makes skin even-toned and improves complexion. * Removes sun tan with continuous use. * Gives healthy, glowing skin. * Can be used as an anti-aging face wash since it contains nourishing ingredients and doesn’t dry out skin and prevents wrinkles. * Contains a whole list of impressive ingredients like almond, lemon peel, black & red gram, rose, fuller’s earth, neem, turmeric and geranium essential oil. Not right now as I have some face washes to finish. But would definitely repurchase in the near future. Mitti Se Wild Essence Face Scrub (or Face Wash as it is currently named) is a wonderful product for daily use. If you love using natural products, you should definitely try this. And surely your skin would be much more healthy and radiant than using drugstore chemical face washes. The sounds amazing 😍 I am liking powder form cleanser and scrub this day. Sad they stopped the manufacturing of this but i will definitely like to try the Facewash similar to this one. I like that it leaves the skin with a cooling sensation. This would definitely feel good to use during summers.